CONVINCING PROOF Here's rather convincing proof that the movies haven't a corner on beauty. 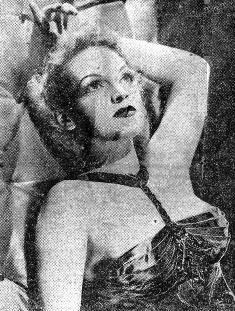 Milena Miller will stack up with the best pin-up's the Roundup has ever cast a longing look at. She's a CBS radio singer and draws plenty of 'aha' in public. GEN. SULTAN'S HEADQUARTERS, MYITKYINA - Troops of Gen. Liao Yao-hsing's Chinese Sixth Army made a sensational 40-mile advance south of encircled Bhamo this week, while the 10th Air Force seized advantage of the end of the monsoon to harry Jap forces being pressed southward from the Irrawaddy River line and from the Salween Front. The Sixth Army Forces which by-passed Bhamo and Katha have not yet encountered strong organized resistance. Behind them to the north, however, the Japs besieged in Bhamo are holding out stubbornly and the enemy facing the 36th Division in the Railway Corridor fought bitterly before giving up Pinwe. The full might of the 10th Air Force has been turned upon the Japs moving south from the Salween Front, both by truck down the Burma Road and by boat down the Shweli River. Additionally, more than 600 sorties were flown one day in North Burma, hundreds by Troop carrier planes which, during November, carried more than 25,000 tons of supplies to the Chinese in Burma. "By-passed Bhamo now is of minor importance," declared Lt. Gen. Dan I. Sultan. 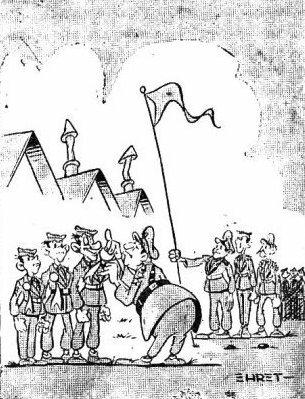 "We want Bhamo," said the general, "and will take it. But not at any great cost in lives lost." This week, the ring around Bhamo was tightened. Chinese troops captured the airstrip at week's end, units in the north moving south to meet units moving north. Junction was first made 300 yards west of the field, clearing it of rifle fire. Despite six-foot ditches and glider blockades, the first American liaison planes landed a day later to bring out casualties. It was erroneously reported early in the week that Bhamo had been entered. The British 36th Division occupied Pinwe at week's start, after a stubborn three-week fight. Opposition suddenly dissolved. When patrols went forward, they discovered empty bunkers, generously booby-trapped, 100 Japs probably killed by aerial and artillery bombardment and three truckfuls of equipment and ammunition. Preceded by the bagpipes of the Royal Scots, the British moved into Pinwe. Their next objective along the Railway Corridor is Naba Junction, seven miles south. Between the two points, the Japs have set culverts afire and have blown up a bridge, according to aerial reconnaissance. British patrols have moved two miles down the corridor from Pinwe without encountering opposition. CHUNGKING - (ANS) - Foreign Minister T. V. Soong emerged this week as the right-hand man of Chiang Ka-shek and the number two man in the Chinese Government. Soong was elevated to Acting Vice-President and later to Acting President of the Executive Yuan or Cabinet, by the National Supreme Defense Council of which Chiang is chairman. In the move Soong took precedence over his brother-in-law, H. H. Kung, Vice-President of the Cabinet. The Associated Press said Soong is regarded in Washington and London as possibly China's most competent diplomat and statesman. BURMA - Turkey, cranberries and we suspect maybe even gravy were last week added to the cargos hauled by a 10th Air Force Combat Cargo Group operating over Burma. Thanksgiving Day was the occasion. Beginning early that morning, the crews fanned out as far as the Burma fighting lines, spraying isolated posts with holiday groceries. After three hours practice, any given crew could drop a cranberry into a 4.5 mortar from 4,000 feet. The turkey run was, for the day, given a higher operational priority than the Combat Cargo "routine" hauls of bombs, rations, bulldozers, etc. Packed in bamboo baskets with parachutes attached, the meals were dropped within firing distance of the Jap lines by unarmed C-47's flying without top cover. One crew was assigned the special delivery route, with almost a dozen different orders to deliver, scattered throughout the hills and jungles. Drops were made at far-away places, where as few as two men were stationed. The two meals, chuted down, reminded the men that they had not been forgotten. At one advanced point, a transport was chased off by Jap ground fire while making an approach run. The pilot ducked behind a handy mountain, got a little more altitude, and went in again with the nose down and the throttle wide open. The turkey may have bounced when it hit, but it got there and the crew came out unscathed. Main action on the 14th Army front in North Burma this week centered on the Jap supply base at Kalewa, occupied by East African troops after a drive from the west and north. The Japs had erected strong points along both sides of the Myittha River and the East Africans had to reduce these positions singly. The Nips had left their usual quota of suicide squads behind. The East Africans were aided in their advance by tank units from an Indian cavalry outfit. Earlier in the week, air reconnaissance indicated that the enemy intended to evacuate Kalewa, since pilots reported the Nips were blowing up their supply dumps. Along the Chindwin, Indian Army troops have established themselves 22 miles east of the river. The bridgehead at Sittaung has been consolidated with little opposition. In the Arakan, patrol clashes and artillery duels took place south of Maungdaw and in the Mayu range. Patrols have also found evidence that the Nips intend to withdraw from the Paletwa area. Strong aerial support also featured the week's activities. RAF Thunderbolts and Hurribombers gave support to the 14th Army along the Chindwin-Tiddim front. Jap Headquarters at Ye-U were hit and Kaduma was severely punished. The junction of Allagapka was hit and airfields at Heho and Meiktila were strafed. Enemy supply lines along the Arakan, Kaladan and Chindwin fronts were struck by special groups of Hurribombers, shepherded by Spits. Two bridges at Kongyi and Shwegyin were destroyed, disrupting enemy supply lines to Kalewa. In a strike lasting from afternoon to midnight, Hurribombers bombed the station at Kawlin and a large building at Pinlebu and also bombed Uyin and Kyaiikthin. CHUNGKING - (ANS) - The U.S. Embassy here has ordered all American nationals to evacuate Northern Yunnan Province and threatened Kweichow Province as two Japanese columns menace Kweiyang, capital of Kweichow. Kunming, headquarters of the 14th Air Force, and of Americans who are engaged in the Salween campaign is included in the order. The evacuation command will affect Red Cross workers, missionaries and civilian agency workers, the Associated Press said. The Chinese Government faced one of the gravest military threats of the eight year war with Japan as enemy forces drove to within 80 air miles of strategic Kweiyang. The United Press said Chiang Kai-shek must hold Kweiyang until the Burma Road can be re-opened, and that though he has been trading space for time, he is now running out of space. The Chinese High Command said two enemy columns are attacking less than seven miles from Tuhshahan but that another force 45 miles south was halted near Liuchai. The Chinese said the Jap invasion of Kweichow began with skirmishes in Dawn Pass, just inside the border of the Province. Meanwhile, Maj. Gen. A. C. Wedemeyer, commander of the U.S. Forces in the China Theater, said the situation in China continues unfavorable but that remedial measures are being taken. Wedemeyer said the Japanese had forces concentrated along the Kweichow-Kwangsi border region. He also stated that the enemy is driving towards a corridor into French Indo-China after swiftly advancing through Kwangsi Province. The American head said tonnage is being flown into China from India at an increased rate and that all effort is being concentrated on accelerating this movement. FULLER ARRIVES AT CEYLON H.Q. KANDY - (ANS) - Maj. Gen. Horace H. Fuller arrived at SEAC Headquarters this week to take over his new duties as Deputy Chief of Staff to Adm. Lord Louis Mountbatten, replacing Maj. Gen. Albert C. Wedemeyer, now chief of U.S. Forces in China. It has also been announced that Mountbatten's new Chief of Staff will be Lt. Gen. Frederick A. M. Browning, succeeding Lt. Gen. Sir Henry R. Pownall, who gave up the post because of illness. Acting Air Marshall Leslie N. Hollinghurst has been named commander of Base Air Forces, SEAC, and Acting Air Vice-Marshall Alfred C. H. Sharp is the new Air Officer in charge of Administration, SEAC. CHUNGKING - (ANS) - Donald M. Nelson said this week that his goal was to double China's war production within six months, adding that his program so far had not struck a single snag. At the same time, six of nelson's experts returned from a survey to report they found steel plants working only one shift, six days a week. STRONG LADY Toting a gasoline drum destined for the I-B Theater is a cinch for this young lady. That's because the Alcoa engineers recently developed the new type aluminum drum, which weighs 21 pounds, 30 lighter than the conventional container. Time marches on. CHINA AIR SERVICE COMMAND AREA HQS. - Not content merely with keeping USAAF planes in the air, Air Service Command mechanics here are now busy teaching their trade to qualified Chinese workers in one of the most complete airplane overhaul plants in all of China - "Factory Ten." At Factory Ten, a large compound dotted with makeshift shops and hangars, the mechanically-apt of China, selected by an organization similar to the U.S. Civil Service, are taught how to repair and service aircraft from rudder to propeller, from cockpit to landing gear. Fruits of their studious labor are seen in the fighters and bombers roaring back into the skies after a visit here for repairs. The courses given these students are actually better and more advanced than those available in many Army schools in the U.S. In the States, future mechanics are given salvaged and obsolete types of aircraft for training examples. But here the Chinese students are permitted to work on the latest types of war planes. To illustrate the effectiveness and importance of their work, Capt. Amil C. Stafford, Engineering Office of Factory Ten, points toward the "line," where one Chinese crew is putting the finishing touches on a P-51 prior to its test flight. In another area, a similar student-crew, armed with American rivet guns, applies its combined skills to a C-46 that had been damaged by a forced belly landing. Stafford's staff of instructors and supervisors are graduates of regular AAF Technical Training Schools who have become expert mechanics through on-the-line experience in China, India and Burma. Factory Ten, of course, has many sub-divisions, all of which are carefully supervised by American mechanics. S/Sgt. Bernard J. Sirois bosses the sheet metal workers; Sgt. William F. Hyland, the plastics area; Cpl. Adolph J. Wachutka, the machine shop; Sgt. Orville F. Faris, the instrument and electrical shop. The importance of the job being done is summed up in the remarks of S/Sgt. R. E. Clements: "We don't look like much here, but we turn out some of the best mechanics this side of Chanute Field." CHINA TRAINING AND COMBAT COMMAND - Ninety-three battle-tried Chinese officers, including nine brigadier generals were graduated recently from the General Staff School after completing a course in American Army methods. and made frequent trips to nearby American air bases and Field Artillery schools. It was rigorous training, and as one graduation day speaker pointed out, "Great achievements may be expected from these especially-trained staff officers." Besides a regular class ring, each graduate received two diplomas, one written in Chinese, the other, English. Special prizes went to the three officers having the highest scholastic record. Generalissimo Chiang Kai-shek sent congratulatory telegrams to the graduates. Among the many speakers were Maj. Gen. Gilbert Cheves, new chief of SOS in China, and Brig. Gen. Frank Dorn, who stressed the excellent performances of previous graduates on the Salween front, particularly in the Lungling and Sungshan areas. WITH THE 36TH DIVISION, NORTH BURMA - One hates to be drippy, but one has to admit: Yanks and British get along wonderfully together on the Road to Mandalay. We have three numerically small but highly important units attached to Maj. Gen. F. W. Festing's ferocious 36th Division. Wholly American is the division's air support. American artillery officers command and G.I. 's aid its Chinese cannoneers, and one of our portable hospitals, originally assigned to minister to the Chinese, performs most of its surgery. All three units advance with the British through the Katha Railway Corridor and, although they sometimes feel forgotten by and torn away from their buddies, they are made to feel at home in their new company. The perpetual cause of distrust on account of higher pay is out of the picture because there is no way to spend money. True, the Yanks get dropped more cigarettes and beer, but they share these with the Tommies. On the other hand, Festing's Killers, who know the fondness of Americans for hard liquor, bring their rations into our perimeters. And everybody is wrapped up in the campaign, the keystone of the pleasant partnership. A very old truth: From the days of Caesar to MacArthur, Allied armies fought each other in barrooms and brothels. Not so in the field when men of the same mettle were engaging a common foe. The German and their former Italian allies, for instance, loathed each other even in the field because their martial qualities were so different. Here in the Railway Corridor, however, the qualities of Yanks and British complement themselves in a most efficient synthesis. The British are extremely pleased with their American Air Support Team, a detachment of a Tactical Air Communication Squadron, 10th Air Force. The squadron, by the way, is the only Army Air Force organization which comes in direct contact with the enemy on the ground in the normal pursuit of its duties. Its team with the 36th Division moves always with the forward battalion and virtually "talks" the pilots in on the targets. When our fighter-bomber pilots approach these targets is support of the ground troops, they are in direct ground to air contact with the Air Support team in the O.P., often only several hundred yards from Jap machine gun emplacements. Direction of planes to targets from such a close vantage point has had amazingly good results. The team, a couple of lieutenants and two handfuls of enlisted men, went during the past four months through thick and thin with the Division. The air supporters waded through rivers and marched many miles over jungle trails carrying their radio equipment, packs and guns over their heads to keep them dry. Cpl. Heinie Coren and Pfc. Douglas Bragg have been recommended for citations for working under severe combat conditions with technical proficiency. Husky Festing once found a couple of air supporters stuck with their jeep on a muddy road. He dismounted, knelt deep into the mud and helped to lift the vehicle with his gargantuan shoulders. The general is equally pleased with his artillery support. To Lt. Col. Trevor N. Dupuis, NCAC's veteran liaison officer, he said: "I have never seen better artillery support." The smooth, suave American colonel maintains with a number of U.S. officers, G.I. signal men and drivers. Chinese interpreters and surprisingly accurate Chinese cannoneers, the nucleus of an artillery headquarters within his own perimeter. The colonel would eagerly wait for the afternoon patrol reports in order to harass the enemy's night positions. Result: Complete Allied artillery superiority. The Jap never dares to answer the colonel's cannonades in daytime because he fears we'll spot and knock out his last few howitzers. The American portable hospital, which traveled in the past with Merrill's Marauders, the Chinese 22nd, 38th, and the 3rd Indian Divisions, is perhaps the most pro-British Yank unit in Burma. Almost every night you'll find stretchers with ambushed Tommies in its operating tent. American, British, Chinese and Indian soldier spectators often stand through a whole night under the hospital floodlights, watching silently how a friend's life is being saved. These are moments of union none will forget. T/Sgt. Louis Barror, from Los Angeles, will proudly tell you his outfit's saga. He says: "We have a citation and a flag from the Chinese commander of the 22nd Division in gratitude for rendered efforts. Once a Jap unit came into the rear of the division and we had to face the frontline fire while we treated the wounded. We were the first portable hospital to treat Wingate's Raiders when they came out of the jungle. Many had typhus and malaria, all were undernourished, their feet had the jungle rot. But their morale was very high. That was the first time we had met the British. And now scarcely a day goes by that they don't express their gratitude." So, you see, the Killers learned to like the Yanks, who march with them to Mandalay. Each knows the other's assets and limitations. But the man who knows them best is Festing. The Bawgyo Railroad bridge, vital link in the Jap supply line, stands stout and firm in the picture on the left. But after bridge-busting B-25's of the 490th Bomb Squadron paid a visit, the Nips were unappreciative of the dunking given one of the spans as photographed, right. The Bawgyo Railroad Bridge, second most important bridge left to the Japanese in that portion of Burma that they still hold, was destroyed recently by the 490th Medium Bombardment Squadron, 10th Air Force. The bridge is the only rail link on the Mandalay-Lashio Railroad and its destruction put a serious crimp in the Japs' line of communication into Northern Burma. The 490th squadron called this its 100th bridge demolished. Actual records show the 490th to have more than that number, and therein lies a story of modesty. Official records give the 490th more than 100 bridges. Where holes were put in spans, where railroad tracks on the bridges were torn up, and where the bridge itself was regarded as unserviceable, the official records give the squadron credit for a bridge knocked out of commission. The 490th Squadron pilots, however, do not consider that they have demolished a bridge unless they knock out at least one span completely into the river. One span of the Bawygo bridge was bombed into the river, and since it was the 100th bridge to suffer that fate, this made the century mark official. remarking: "Sit down, son, make yourself comfortable. Now listen, son. This is what I think about your chaps and my chaps. You have shown phenomenal progress in applying modern science to the arts of war. We are far behind you. Your great number of mobile hospitals in this theater simply amazes us. "I have seen a little of Merrill's men. Your chaps seem to be better built than ours. They have broader shoulders. When they are tough, they really are tough. But I have seen other units and they seemed to me more or less technicians in uniform. Excellent drivers, mechanics, engineers and a little less soldiers. We try to make first a soldier of a new man because we believe so much in infantry. I especially favor the foot soldier. We are immensely grateful, mind you, and you have all our admiration for the magnificent air support and supplies you are giving to our division, but I dare say, the infantry man deserves just as much credit. We will not reconqueor land, and battles cannot be won without him. The foot soldier still is a formidable war machine. Even the Japanese. Look how much trouble we have with them. We would love to see an American Division fighting side by side with us, son." 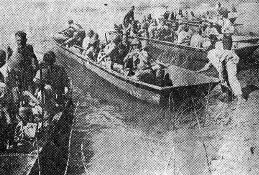 Assault boats, powered by heavy duty outboard motors, carry Chinese troops across the Irrawaddy River in North Burma. Lt. Gen. Dan I. Sultan in the field with his troops. Chinese troops of the 38th Division march over steep, precarious paths to encircle Bhamo. Prompted by several recent articles in the Roundup advising G.I. 's in these parts what precious gems to buy and when to keep your G.I. earnings in your pocket. Pfc. Harry J. Berner now warns us gullible folk about the snares and pitfalls to be encountered among the local souvenir dealers. Berner, now with a Malaria Control unit at APO 629 (Chabua, India), was formerly with the advertising department of the Philadelphia Public Ledger and should know whereof he speaks, having a 'fair knowledge' of merchandise values. being a "servant of the people," the Roundup herewith passes on Berner's information. For Rs. 35 to 65, a be-turbaned merchant will offer you a women's Chinese silk robe, straight cut, beautifully colored. But, says Berner, there is a good chance it is not silk. It may be only a cheap grade of rayon. And those beautiful colors will run all over everything at the first washing. Besides, you can get the same thing back home, made in Mexico, for $1.97. And beware of attractive ivory carvings, Berner warns. Local prices are almost triple those in the States. Much of the stuff is second or third grade, with genuine first grade being used for piano keys. Real ivory has a grain, and if what you buy is "stark white and brittle," you've a nice chunk of bone. Many of those brightly-sequined and tinseled evening bags and purses are sucker bait, too. They're made of "cheap cotton or rayon and lined with poor grade muslin." Strictly carnival prizes, out of style in 1925. The same thing often applies to these handsome "hand-embroidered" pillow cases, bearing shining replicas of the Taj Mahal and such. Concerning "real lace tablecloths," which are sometimes sold for Rs. 55, Berner says, "This is the same thing American movie houses used to give away for free to women patrons at matinees." Strictly thik nai. "By far the most liked of all souvenirs by women and girls of all ages," says Berner, "are Indian coin charm bracelets." Pay according to the amount of coins and the craftsmanship, he advises. If the question has occurred to you, as it has to us: "Well, what the hell can we be safe in buying?" Berner has an answer for that, too. "Buy War Bonds," he says. BURMA - S/Sgt. Walter Kirschner, pride of Lorain, O., is gathering tangible evidence of bug life in this corner of the globe and when he's through he'll really be able to show why a G.I. "goes bugs." he started his collection in India and is now with the Burma Peacocks, crack ASC group that keeps 'em flying here, and he's adding new species to it. Strangely, Kirschner knows little entomology. In the days when he sported striped ties and blue suits, he was an interior decorator and painter, working with his father. That was four years ago. But he became fascinated in Assam with the assortment of insects that flitted about night and day. He set up a cloth-covered panel and began to attach those that fell victim to his trapping net. Then he cornered a baby cobra and a lizard. These he preserved by bottling. His wing-fitted collection ranges from the humble butterfly to the tarantula. And those that bite, says Kirschner, have sampled him - except the tarantula. Walt's two brothers, Arnold and Elmer, also are in the Army. Arnold being stationed in France at present and Elmer having just returned home from Italy. It took an Indian Theater advertisement to publicly define how a saint gets to the heights. "The greatest saint picture ever produced - he worked his way to IMMORALITY." BURMA - The Stout twins, Pfcs. Melvin and Lester, started life together in Martinsville, Ind., and wound up together recently in a Burma hospital, both suffering from combat wounds, both with the Purple Heart, the Bronze Star and authorization to wear a Presidential Unit Citation. It happened like this. The twins came to the India-Burma Theater together seven months ago and went into action together. Their platoon was called upon for an attack across a paddy field and presently they were pinned down by Jap rifle fire. Melvin was wounded in the neck by a ricochet. Lester was unhurt. While Pfc. Melvin was recovering from his wound, he got word that Pfc. Lester was also under glass. He visited an adjoining ward, an, sure enough, there was his brother, who had stopped a piece of mortar shell in a later action. Now all the Stout boys have to do is to start sweating out rotation together. JAP DIVE-BOMBER FAILS IN ATTACK Smoke and water tower high beside a U.S. Essex Class aircraft carrier as a Jap dive-bomber misses in an attack off Formosa. In the foreground, gunners mates on another U.S. warship keep shells moving up to their anti-aircraft gun in the savage battle with enemy planes. SALWEEN FRONT - The American-trained and equipped Chinese troops of the Salween Expeditionary Force, accompanied by the American liaison China Training and Combat Command group of Brig. Gen. frank Dorn, this week were driving towards Wanting on the Burma border. 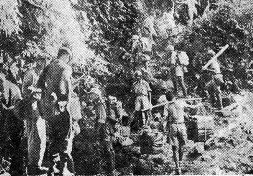 The Salween forces took Chefang, where the Japs had holed up after the successive capture of Lungling and Mangshih, the occupation climaxing a 12-day campaign after the fall of Mangshih. Dispatches say the Salween forces are now only 24 miles from Wanting. The Nips were reported fleeing along the old Burma Road in every conceivable form of transport, taking advantage of cover of darkness to avoid the strafing from the planes of the 14th USAAF. The 14th was also active at the Chefang siege, bombing and strafing the Nip garrison before the Chinese launched their final assault on the 12th day and found the enemy fleeing towards the temporary safety of Wanting. At a 20th Bomber Command Depot, three engine mechanics install a new engine as a fourth G.I. checks the old one. The action took place during a record B-29 repair job. 20TH BOMBER COMMAND BASE, INDIA - Five days after a B-29 made a recent crash landing that damaged the intricately-designed plane, the Super-Fort was in the air again, ready for action. Details of this amazing new record in B-29 repair has only now been released. It is the story of the appropriately-named Totin' To Tokyo, which contracted landing gear trouble returning from a routine flight. The crew of Totin' To Tokyo circled the field for several hours in an effort to check the malfunction, but all efforts were in vain. Prideful of his hard-hitting plane, the pilot elected to crash land instead of bailing out, and the rest of the crew chose to ride it out too. As the Super-Fort hit the runway, she toppled to one side and slid along the stretch on a portion of the landing gear and right wing. Skilful handling by the pilot saved the crew serious injuries, but the B-29 suffered considerably. It looked bad for Totin' To Tokyo. Similar repair jobs had taken from 27 to 42 days. The plane might be out of combat for at least a month, perhaps more. Now the Depot moved quickly into action. Idle planes do not win wars. Two shifts of officers and men were selected to work 24 hours a day. Three engines had to be changed. A new outer wing section was put on, badly bent propellers replaced. Sheet metal specialists rebuilt the nacelles, while electricians and mechanics ironed out flaws and repaired the landing gear. machinists labored incessantly to manufacture special tools and parts. Welders' torches blazed night and day. In the end, this vigorous, complicated teamwork accomplished a feat hitherto unattained, inspectors put their stamp of approval on Totin' To Tokyo. She was ready to fly again, four days after her crackup. A few days later, the men who made it possible watched from the ground and felt a surge of pride as the rejuvenated Super-Fort soared from the runway into the air, meeting every test successfully. As she flew low over the Depot, Totin' To Tokyo humbly dipped her massive wings in gratitude to the men who had given her new life. The following day, Lt. Col. Ainsley E. Stuart, Depot Maintenance Chief, received an official letter of commendation from Col. Arthur V. Jones, Jr., Depot Commander, for the remarkable feat. NORTHERN BURMA - The important "rush job" of a recent project had come to an abrupt halt. Two pieces of one-fourth inch angle iron had to be joined together. The welder of the outfit was off hiding somewhere, nursing his leech bites. S/Sgt. Jay O. Jensen, a man of quick action, shouldered his captured 25 caliber Jap rifle. Fifteen shots perforated the angle iron in six places. The two pieces were quickly bolted together. The job was finished on schedule. You just can't beat Yank ingenuity. Again! A great force of B-29's thundered into the dawn at breathtaking one-minute intervals from this island, which five months ago belonged to Japan. The giant planes doglegged in the sky to form patterns of nine or 12 as they headed northwestward toward the most heavily-guarded target in the Far East - Tokyo itself - some 1,500 miles from this base. GENERAL GREETED Maj. Gen. Robert B. McClure, right, who commanded the American Division in the Southwest Pacific, has been appointed Chief of Staff of U.S. Forces in the China Theater. He succeeds Maj. Gen. Thomas G. Hearn, veteran of the 1942 Burma campaign who is leaving for the U.S. for a new assignment. 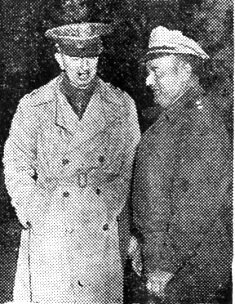 McClure was welcomed to Chungking by Maj. Gen. A. C. Wedemeyer, left, Commanding General, USF, China Theater. The newly-arrived Chief of Staff commanded the division which relieved the Marines on Bougainville. Meanwhile, it was announced that Maj. Gen. C. L. Chennault, 14th Air Force leader, has been made Air Advisor to Wedemeyer. and the Bonin Islands and by photographic reconnaissance over Tokyo. But they expected to rudely surprise the Japanese from the standpoint of the impressive scale of this initial major combat mission. The B-29 which photographed Tokyo on Nov. 1 and several times since discovered that the Japanese capital is ringed by elaborate airfields packed with planes. The entire Yokohama area adjacent to the sprawling capital bristles with anti-aircraft guns which put up the most intense barrage. Some of the huge planes took off today from the magnificent Isely airfield, which was constructed on the comparatively small Aslito Field, the main Japanese airbase in the Marianas. Isely is one of a series of Super-Fort bases already built or under construction at Tinian, Guam, as well as Saipan. Indicative of the scope of future operations against Japan, Hansell warned that despite the large size of the initial attack the B-29 missions must be regarded as still in the experimental stage in this theater. Today's attackers knew that they would be returning after dark with little fuel. They also knew that they must avoid Japanese-held islands in the Marianas and the Bonins. Enroute they had to buck strong westerly winds, though the Japanese autumn and winter seasons provide the best flying weather. The mission also involved difficult navigational problems. Flying north on the sun does not provide fixed stars' guide. The navigator could drift 300 miles eastward or westward of his course without knowing it. B-29 service organizations established themselves on the Marianas soon after the islands were seized. Ground echelons dug in and put up their own tents, cleared cane fields, built roads and even helped rid Saipan of horse flies and mosquitoes. U.S. Army Engineers built airdromes in less than five months in a major engineering achievement of the pacific war. 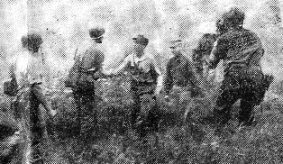 Engineers tackled the Aslito field on the sixth day after the invasion. They had Thunderbolt fighters landing within 24 hours and built B-29 runways, while the field was being used by bombers, fighters and transport planes. Hansell praised the co-operation of shore-based aircraft under Maj. Gen. Willis H. Hale, air commander of the forward areas. 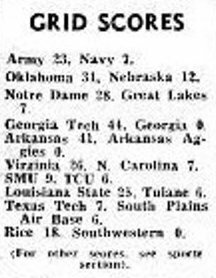 Army, Navy and Marine planes - especially Seventh AAF Liberators - sapped enemy strength in the Carolinas, Marianas and Bonins with consistent attacks. Saipan is an amazing place, its airfields and vast panorama of slim silver B-29's forming a great gleaming patchwork on the coral sands. In the nearby valleys Japanese civilians toil in the gardens, indifferent to the sky monsters that rule the Marianas. NORTH BURMA - Lt. Gen. Dan I. Sultan flew into an airstrip a few miles behind the trapped Japanese in Bhamo this week, accompanied by Gen. Sun Li-jen, commander of the Chinese Sixth Army. There Sultan presented a Silver Star to Gen. Li-Hung, commander of the 38th Division. Sun's hard-hitting outfit before he assumed leadership of the Sixth Army, which includes the 38th and 50th Chinese Divisions. The citation was signed by President Roosevelt and lauded the 38th Division commander for gallantry in action during the victorious Hukawng Valley campaign. From a position skirting Bhamo, Sultan watched American P-40 fighter-bombers drop explosives inside the second largest town in North Burma. CALCUTTA - Pilot Officer William George Duff, RAF, assistant editor of SEAC, daily newspaper for the British troops, was killed this week in the crash of an American Liberator bomber, about 330 miles north of Bangkok. Duff was aboard the plane as a war correspondent, to report on a low-level bombing mission. The aircraft was on its second run over the target when two engines went out in flames, apparently from ground machine gun fire. The plane crashed into a hillside with 11 men aboard. WAC'S WELCOMED WAC's aren't a novelty anymore, except when, like Capt. 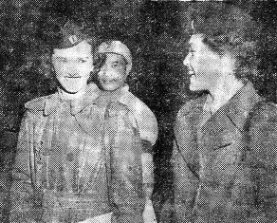 Elizabeth Lutze, left, and Lt. Florence Bullitt, they arrive in China. The two officers will do secretarial work at Headquarters, USF, China Theater. 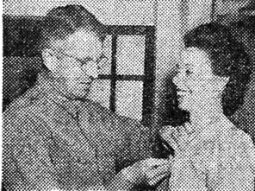 HONORED Mrs. Vera Teal, secretary for G-4, Hq., USF, I-B Theater receives the second Emblem of Meritorious Service awarded headquarters civilian personnel. The decoration was made by Maj. Gen. Frank Merrill. First award went to Mrs. Lorna Johnson, secretary to the Adjutant General. ALONG THE LEDO ROAD - Somewhere along the Ledo Road, at a place where even Eleanor wouldn't go, an organization has come into being which promises to rival the American Legion and the VFW as a post-war veterans' group. It is "The 44 and 2 Corps." main qualifications for membership are overseas service and a stipulation that each member must wear a size 44 jacket and a size two hat. If you've even considered having a thought, if you are capable of rational behavior, then 'The 44 and 2 Corps" is not for you. Only brawn will get you in, Muscles - that's the thing. Out of the sinews, out of the thews of pipeliners establishing a "leechhead" in Burma, the Corps came into being. It is still in the organizational stage and membership is open to any G.I. possessed of a brain the size of a trifling detail. Due to the intellectual qualifications, officers need not fear to apply; but cooks and permanent KP's are ineligible because a 44 jacket in the kitchen is more likely to cover ill-gained blubber than case-hardened muscles. Excluded are those 'eager beavers' who resort to the use of tungsten-carbide teeth or those guilty of posterior osculation. Posterior callouses, too, will keep you out unless you can show them gainfully earned in such activities as bulldozer herding or sliding down telephone poles. The Corps motto is: Spearate, miseri; cavete, felices, meaning "Hope, ye wretched; beware, ye happy." Pvt. Tom Acheson, who has a double hernia and 27 anterior callouses, has been elected Pectoralis Major. S/Sgt. Harold Olsen, who has rice paddy feet and a chronically-sprained back, is Pectoralis Minor. Ray Howard, who learned to read by memorizing the "wanted" posters in the Goose Creek, Tex., post office, is The Skull. He was given this designation because he is the only member who wears a size one hat. T/5 Ted Crunk, the ham-fisted, muscle-bound hunk of humanity from Oklahoma, is the Mighty Biceps. The office of Levator Ani, which corresponds to that of treasurer in more prosaic groups, is open, and applications from pinball or one armed bandit machine operators are solicited. Applicants must have brawn. Prospective members should enclose one K-ration box top (showing toothmarks) for initiation fee. T/Sgt. Wallace Weinstein explains in the accompanying article the deeds of these five shutterbugs, left to right: S/Sgt. Joe D. Ivy, T/Sgt. Anderson F. Kerr, S/Sgt. James E. Flynn, Sgt. Robert J. Kramer, S/Sgt. Archie L. Hawkins. Five shutterbugs of the "Black Angel" Squadron, "Earthquakers" Bomb Group, have been seeing the world - the hard way. With the exception of Sgt. Archie Hawkins, they left the States with the "Earthquakers" on July 16, 1942, well over two years ago - with the first medium bomb group to embark overseas. Africa was their first station but the shutterbugs confined their activities to terra firma until Sgt. Joe Ivy was assigned to missions in Egypt. The second time he went aloft, he stopped some flak, and since then has been satisfied with installing and maintaining aerial cameras. Sgt. Andy Kerr and Hawkins, with 62 and 61 missions, respectively, started viewing 'em from the "wild blue yonder" in Italy, flew on what is the legendary flak alley run, continued in Sicily and are now clicking shutters over Burma. Kerr is 41 years old, possibly the oldest Air Corps combat enlisted man in the Far East. (Dissenters may write to the Roundup, APO 885 - The Editor.) His brother, "only" 43, served two tours with the Eighth Air Force and is now convalescing in the U.S. from wounds received while flying over France. Sgt. James E. Flynn, with 63 missions, Italy-Burma, is flying on borrowed time. On a recent mission, Jap ack-ack fire showered his plane and his parachute absorbed fragments, possibly saving his life. Sgt. Robert J. Kramer has 50 missions, all of them over Burma. he cannot claim anything exciting - other than flying over Burma jungle day after day, through ack-ack and Zeros, helping prove that aerial photos are here to stay. BURMA - To the wounded, isolated, supply-starved foot soldiers, lost in Burma's dense jungles and to the pilots and other crew members who fly her, the UC-64 is a 'sweet little airplane - the workhorse of the skies." The stories told about those small, single-engined utility cargo planes are many and most always exciting. 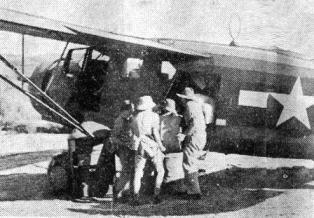 Supplies are put aboard a Norseman, preparing to take off on a flight into the Burma jungles. cut off from all possible help, many of them wounded, some on the verge of starvation. Evacuation by air seemed almost impossible, too, as they were faced with Jap machine gun fire on one side and surrounded by long stretches of rice paddies. Certainly, it wasn't an inviting landing spot for an ordinary plane. Suddenly, a lone, stubby-nosed aircraft appeared overhead, swept low over enemy installations and settled on a small rice paddy clearing. Painted on its fuselage were the five white diagonal stripes of the First Air Commando Group. The plane was a UC-64 Norduyn Norseman bringing in 2,000 pounds of supplies and ready to evacuate 10 seriously-wounded soldiers to a base hospital. Another story of the plane's durability is proudly told by Lt. David C. Beasley, a pilot. "You can bang her up, but you can't keep her down," he declared upon returning from an advanced Commando-built airstrip that had, a moment before his arrival, undergone a severe attack by enemy bombers. His radio wasn't working and he hadn't learned of the bombing that had dotted the runway with dangerous craters. When he landed, one of the craters snatched off his tail wheel. But five minutes later, with the wheel wired into place, Beaseley was back in the air. The C-64, as it is frequently called, is strictly a new bird in India-Burma skies. Prior to last spring's airborne invasion of Northern Burma, Col. Philip Cochran, commanding the Air Commandos, foresaw the need of landing vital supplies upon short strips hacked from Burma's rugged terrain. He needed a ship as tough as the jungle. His choice was the Norduyn Norseman, a plane unproved in any other theater of operations. "We knew very little of her capabilities," Lt. Julius Goodman, a volunteer pilot, admits, "as no other organization had used her in combat. We had thought of her as a very tricky ship to handle because of her narrow landing gear. It wasn't long, though, before we knew her as a tough little workhorse." As operations progressed, new hazards developed to test the aircraft's durability. Shortage of transportation between Commando airstrips and the home base frequently forced the plane to carry 1,000 pounds in excess of its factory-stated capacity. She carried them with ease. The scarcity of C-64's in this neck of the war necessitates the immediate dismantling of their frames after crack-ups. The constant ferrying of troops into small clearings supplying their positions and other outposts with radio equipment, drop packs, ammunition, rations and other supplies, plus evacuating the wounded would diminish the effectiveness of an ordinary plane. But the Norseman, with its Pratt-Whitney Wasp engine, the pilots insist, isn't an ordinary plane. 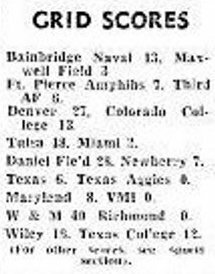 The Japanese suffered losses of troops and horses, freighters and naval vessels, locomotives and bridges, trucks and military stores in the week's air operations of the 14th Air Force. Communiqu�s disclosed that in addition to the freighter sunk and two left sinking in the Yangtze River near Nanking in late November, three naval vessels also were sunk - a 115-foot gunboat and other vessels of 165 and 175 feet. 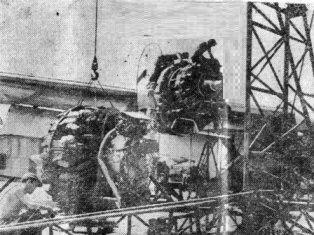 One P-51 fighter unit destroyed seven locomotives and damaged another on the Lungpu Railway between Linfen and Taiyuan. This same unit was reported as destroying 50 locomotives in November in South and Central China. Two missions of fighters bombed railway yards south of Tuishan and hit troop concentrations, killing 100 Jap soldiers and 125 horses. Communiqu�s reported a total of 190 troops and 156 horses killed during the week by strafing fighters. B-24's were active over Samah Bay, Hainan Island; Fort Bayard, Liuchow Peninsula; the Kowloon Docks at Hong Kong; and the Gia Lam railway yards at Hanoi, French Indo-China. 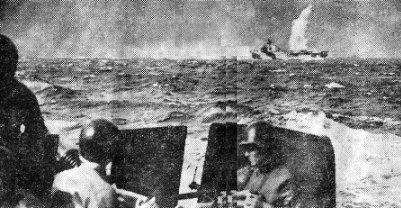 The Liberators bagged two freighters off Liuchow Peninsula. P-38's and P-51's hit seven bridges in widely-separated areas and P-51's and B-25's strafed and bombed traffic and installations on the Salween Front, the B-25's supporting Chinese ground forces in their drive into Chefang. UNCLE JOE AT HOME Study of a general enjoying a visit home. 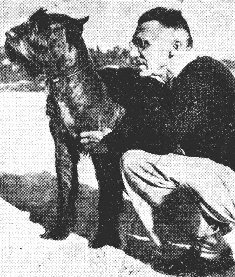 Recognize Gen. Joseph W. Stilwell relaxing at Carmel, Calif., with "Gerry," his giant Schnauser? Uncle Joe looks strictly un-G.I. with an old black sweater and sun tanned slacks. The Japs this week discovered that the aerial destroyers of the EAC had little respect for their persons or supply lines. Railway installations, sheds, shipyards, camps and bridges in the vicinity of Bangkok were hit and set on fire, at some points 1,000 miles from the RAF and USAAF Liberator bases. Pyinmana and the Mandalay freight yards were bombed by the U.S. heavies, the station getting a direct hit in the latter raid. The 490th Bridge Buster Squadron knocked out four bridges in widely separated spots as 10th Air Force aircraft continued blasting of Jap communication lines in North Burma and supported Chinese forces at Bhamo and the British at Pinwe. The 10th knocked out two spans of the Myitnge Bridge by dive-bombing. ten waves of P-47's destroyed a whole village with its Jap supplies and personnel in the Lashio area. These planes destroyed the bridge at Inailon and part of the bridge at Ho Kho. U.S. B-25's of the Third Tactical Air Force knocked out the span of a bridge near Kyaukse and hit another bridge north of Pyinmana. A bridge and tracks were damaged near Sintegon and railway rolling stock was exploded at Pyinmana and Totkon. Air Commando craft, in a daylight dive-bombing attack, put a 1,000-pound bomb in the center of the by-pass bridge over the Mu River west of Mandalay, knocking out the center span. Beaufighters of the Third Tactical Air Force had a busy week, aided by bright moonlight, in which they left a Jap ship in flames near Kalegauk Island and hit three other ships off south Burma. Hangars, locomotives, and animal transport were hit in various spots in Burma. BURMA - The Twin Dragons Fighter Squadron, 10th Air Force, celebrated its first anniversary of air combat on Nov. 20, ending a year of costly destruction to the Jap. On this day it was recalled that during the past 12 months, the Squadron has received for its accomplishments six Silver Stars, 33 Distinguished Flying Crosses, 36 Air medals, eight clusters to the DFC and nine clusters to the Air Medal. But of all their deeds, the Jap probably remembers most clearly the period between March 11 - May 26, when the Twin Dragons accounted for 123 Nip planes destroyed, 20 probables and 46 damaged. "The Jap is in a bad fix. How bad, we don't know. Everybody has been giving him hell. The submarines have been giving him trouble in the ocean, 14th Air Force and MacArthur and Nimitz have been giving him hell in the air and sinking his ships. Our own air force is raising hell with his communications." The author of these forthright, soldierly phrases is Lt. Gen. Dan I. Sultan, commanding the India-Burma Theater, the burly, craggy main squeeze in what has been characterized as "an out-of-the-way war among the unpronounceable names." Maybe it is out of the way and some of the names are etymological horrors; the fact remains that during the past month, Dan Sultan's British and Americans and Chinese, and their other allies, have been in a fair way of going to town. Let's take a look at what's happened since the end of the monsoon. First off, the announcement of existence of the pipeline, running from Calcutta's dockside into north Burma. Most everyone knew it was being built, but it remained for Sultan to underscore the strategic importance of Burma's "Big Inch," the artery that one day literally will provide oil for the lamps (and planes and trucks) of China. China and Burma are two countries where the art of getting there fastest and mostest is profoundly complicated by poor communication routes. Trucks and planes and more trucks and more planes, all big gasoline eaters, are carrying our people to victory. Gasoline, as Sultan emphasized, is on a par with food and ammunition as an essential of modern war. It is no longer a secret that for many weeks B-24 Liberator bombers from the famed Seventh Bomb Group were diverted from combat and used to fly gas over The Hump, fuel for the continuing operation of the 14th Air Force in their desperate struggle against the surging Japs. It never was a secret that gasoline is difficult and cumbersome to move by rail or by road. None knows that better than a commanding general in a theater of operations. Pounding home this fact, Sultan said, "The construction of the pipeline is of tremendous strategic importance from the logistical point of view. We foresaw the need for pipelines from Calcutta into the Assam area and these lines are being extended into North Burma, with China the ultimate destination. Gas is liquid gold." It is huge quantities of Dan Sultan's liquid gold that is powering the Allied drive south along a 300 mile front from the Chin Hills in the west to the Salween in the east. In every sector, down every corridor, the drive is south and further south. Two weeks ago, Bhamo was viewed as a vital target. Today, Chinese forces of the 38th Division are 40 miles below Bhamo. The latter is surrounded. Sultan has stated that the town is completely isolated and that the Japs in there are "sitting ducks." The general says, in a quietly grim fashion, that if the Jap chooses to make a suicidal stand - well, that's the way it will be. "We want Bhamo and will take it, but not at any great cost in lives lost." Along the Railway Corridor, the all-British 36th Division has occupied Pinwe, which proved to be a ghost town, a military vacuum. There were Japs there, all good ones. Very dead, apparently dispatched by artillery fire and the savage pounding of the 10th Air Force. Maj. Gen. Howard C. Davidson has kept the 10th Air Force flying these past few weeks. The Japs, retreating in such haste that they have moved in cloudless daylight, have been perfect targets for bombers and strafing fighters. Along the old Burma Road and down the Shwelhi River, the Jap has fallen back and the planes of the 10th have speeded his departure. On one day this week, the 10th flew 600 missions, including food and ammunition drops to the Chinese from Troop Carrier planes. Back many months ago, when the Wingate-Cochran team poured men deep into Burma from the air, the password was "Mandalay." Today, this week, Mandalay is becoming a watchword as well. Sultan's allied armies, foot and air, well integrated, well fueled, are on the move, on the road south, the road to Mandalay. HISTORIC MEETING IN BURMA This is the historic first official meeting of American liaison groups from the Salween and North Burma fronts. Maj. Benjamin Thrailkill (wearing helmet, back to the camera) of the Burma forces shakes hands with Lt. Col. John Cleveland of the Y-Force. The meeting was at 9:30 in the morning, and the photographers had difficulty because dense fog limited visibility to a few yards. To Leave Its Imprint In Far East? A scurrying survey of newscopy which has floated into the Roundup office via carrier pigeon, in sea-borne bottles and the ends of cleft sticks reveals that Robinson Crusoe, that old castaway, was small potatoes compared to the average G.I. out hyar, who is simply one bursting bundle of ingenuity when it comes to improvising that which he hasn't from what he has. In the past six months our full time "Yank ingenuity" editor, one of the lesser known wide-eyed and uncombed characters to be met with under desks in the fishwrapper's editorial offices, has goggled at formulas for countless Goldbergian devices whipped up by imaginative woods-wallahs using only twine, paste, matchsticks and some old jeep parts. This oft-bespoke ingenuity is not of military origin alone, but rather a native American trait. Verily, sundry malpatriots have turned this quality to evading Armed Service, as the Alabaman who took to the woods, the Kentuckian who reported his own death, two Connecticuters who faked drowning and an Oregonian who dressed as a woman - all turned up, however, by the FBI's draft evasion agents. On occasion, ole debbil ingenuity has gotten the boys into a passel of trouble, as the CBI characters who slickered their way home by air, minus orders, for a spot of absence without leave. Not all MP's were as ingenuous as these birds were ingenious, however, and they, too, came to grief. But most of that happy faculty for improvisation has been turned to the doing of good by soldiers in Asia. Stunts of major strategic importance, such as breaking down huge pieces of road-building machinery, flying the parts into inaccessible regions along the Ledo turnpike and reassembling same with fancy welding maneuvers, have featured the list. Construction in North Burma of the "bamboo inch," a water pipeline that required not a yard of hard-to-get steel pipe, was an example of you-know-what at its best. In the early days of air-dropping in CBI, a sergeant named Humple schemed to beat the labor of dragging each item to the aircraft's open hatchway and heaving it out, came up with a rack which could be loaded with rice bags and easily up-ended for a wholesale delivery. He called his device the "Humple Dumper," and lads in Assam used to keep track of their evening's consumption of Bull Fight booze by saying, "I jumped the Hump with a Humple Dumper" rapidly three times in a row. Ingenuity has also reared its ugly head in such minor fields as extermination. Many of the basha boys have turned their efforts to mouse trap construction in the dual hope of dispatching unwanted rodents and persuading folk who believe in old sayings to beat a path through the heavy jungle round their door. Within these deadly contraptions, brother rat may be variously crushed, electrocuted, smothered or poisoned. Some do everything but furnish a death certificate. At one station two errant electricians rigged up an HVBK (high-voltage bug killer), stretching charged wires across a wooden frame to give friend housefly a 100-watt hot foot. Ingenuity reaches white heat intensity in the deep tangled wildwood among the real fightin' troops, where creature comforts are negligible. Here men read and write in the jungle night with the aid of lamps consisting of a length of parachute rope dipped in a C-ration can of insect repellent, or that dependable inflammable, CWS shoe impregnate. Unlikely to appear in the post-war magic kitchen, but useful for short orders, is the Hukawng hotplate, a stove made by pouring gasoline in a canful of sand and setting fire thereto. 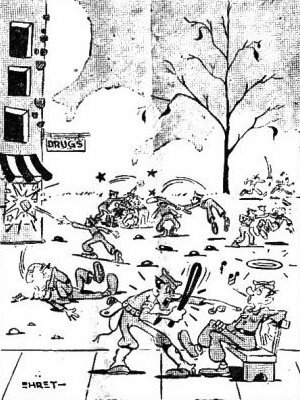 The Yank ingenuity bug even bit Merrill's Marauders, who fried eggs on shovel blades over their campfires. The list is long. Hot weather fans made by sticking paper fan blades into electric razors, rice paddy kayaks built by G.I. boatmen from aircraft belly tanks, an ATC China base coffee shoppe made of a washed out C-46 fuselage - these are but a few. In wartime CBI as in peacetime Shangri-La, it is "so American to want something better," and every man is his own Edison. Considering baggage limitations when we all ultimately catch that troopship leaving Bombay, U.S. forces should leave behind in India and China a collection of peculiar gadgets that will incalculably enhance the American legend.